November | 2011 | Oh Canadiana! To Beaver or not To Beaver – That is the Question! About two weeks ago Senator Nicole Eaton boldly suggested that Canada adopt the polar bear as our new national mascot; replacing The Beaver. She feels that the beleaguered white bear would be a more majestic icon than the ‘dentally defective’ beaver! No doubt the polar bear does exude a certain awesomeness that will forever trounce The Beaver’s rodent roots. I thought it was high time I stood up for my bucktoothed buddy The Great Canadian Beaver! No matter how unimposing my little friend may be he is a cornerstone of Canadian history! 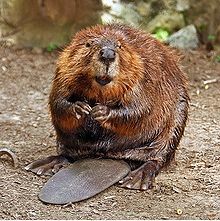 Way back in the 17th Century The Beaver was the most sought-after commodity of the new European traders who had founded The Hudson’s Bay Company. It became apparent very early on that the North American Beaver pelt was ideal for the creation of the many felt hats worn by the fashion forward British populous! Rapidly the Beaver pelt rose to prominence as the primary trading unit in this new economy. Even in those early days The Beaver was given the honour of being part of the original HBC crest. So you see The Beaver cannot be so quickly dismissed as an icon of Canadian culture. Without my furry little friend the landscape of this place we call home would likely be very different. Not to mention this wiley little rascal so wonderfully encapsulates the Canadian identity. Beavers are hard working, industrious and resilient! Canadians are hard working, industrious and resilient! We are also a people known around the world for our comedic bent – so doesn’t it make perfect sense for us to have a mascot that simply is just a little bit goofy in nature? Also, like most Canadians, The Beaver is a creative and adaptable animal – making his home in some of nature’s more inhospitable environments. Anybody who has lived through a Great Canadian Prairie Winter knows that it is the epitome of inhospitable! Personally, I think it’s a perfect fit – the ideal marriage! First and foremost as an ardent seeker of all things uniquely Canadian I am all too aware of the delicate nature of the Canadian National Identity. We have barely begun to forge a lasting presence in the history of the world as one of the youngest nations of our kind on the planet. The Beaver is at the root of who we are – we really owe him! So I say let’s continue to celebrate his contribution to this spectacular nation of ours. Bravo Mr. Beaver, bravo!